The YSL Shopper tote was featured in my last post, the Best Designer Totes for Summer 2017 alongside the Louis Vuitton Neverfull and the Mulberry Tessie. I have mine in black but they come in several different colours and currently retail at £645. It comes in a gorgeous Saint Laurent box with a drawstring dust bag. When I was browsing for my ideal tote, I kept going back and forth between the YSL tote and the Louis Vuitton Neverfull. Both of these bags are quite similar and both come with a removable pouch inside that can be used as a clutch. I couldn’t decide between the two and spent many hours watching YouTube reviews and reading forums to try and help me come to a decision. 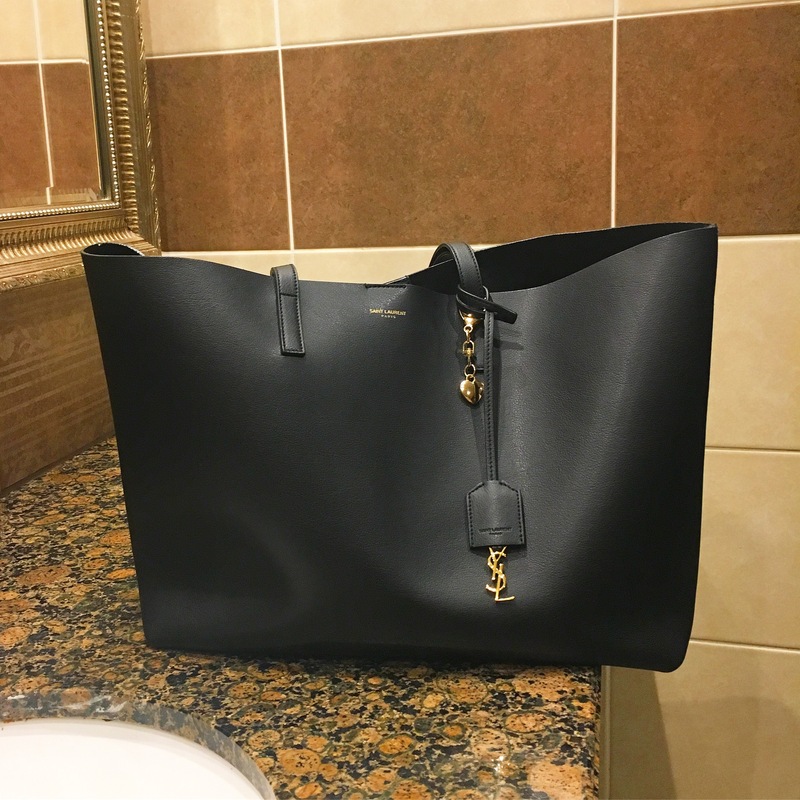 After doing a shed load of research, I eventually decided the YSL tote was the one for me. What sold it for me was the wider handles. I’m the kind of girl who carries everything but the kitchen sink around with me, so my tote needed to be comfortable to carry when packed to the brim. I do plan on adding a Neverfull to my collection in the future though, I think they’re gorgeous! 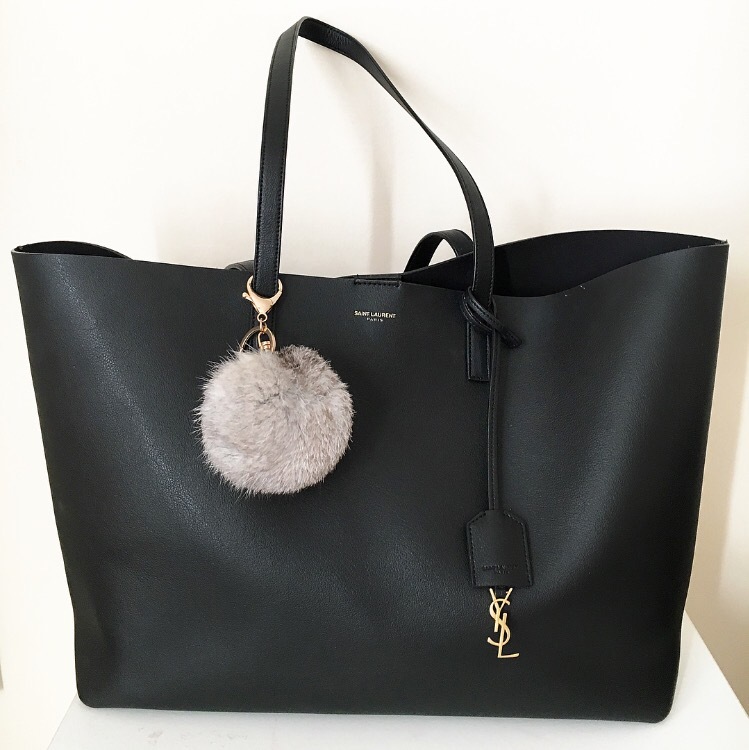 The YSL shopper tote is made of super soft leather and is a no-frills handbag. It’s literally a big hole with no inside pockets and no zipper. It is not a structured bag so bare that in mind before purchasing. Some totes have a thicker, more sturdy shape but this tote is more slouchy. I find when it’s empty it flops over. I have to say though, personally I’m not a fan of structured bags so this was a big plus for me. If you don’t like that style of bag though, I would suggest considering something like the Michael Kors Jet Set or a tote style that has a top zipper. I find the zippered tote bags are a much more rigid shape. The hardware is a beautiful shiny gold and although this bag does not feature a top zipper, it does have a magnetic fastener so you can secure it while you’re out and about. The lining is smooth but also be aware there is no additional lining. The interior is literally the untreated side of the leather. Considering I have used this bag constantly since June last year, it is still in pristine condition. I have taken it to the office, coffee shops, restaurants, bars and it has been thrown into the back of my car on many an occasion. I am not one to baby my handbags but let me tell you, you would never know from looking at this bag now. There’s no marks at all, the leather is tough and has withstood my carelessness. The interior doesn’t have any marks either which is surprising because I’ve carried food, water, make up, clothes and shoes in this thing. Is it worth the price tag? In my opinion, yes. Yves Saint Laurent is known for high quality and boy do you get it. This bag is timeless and will be with me for a lifetime. Previous Let’s Talk Totes! Our favourite Designer Totes for Summer 2017.